Cleaning, legal, consulting, accounting, freelance, catering, tutorial, and all other services are in need of a service invoice sent to the client as a request or demand of a payment due. It also features and clearly presents the details of the service transaction, the type of services performed, the duration of the service, as well as the amount. 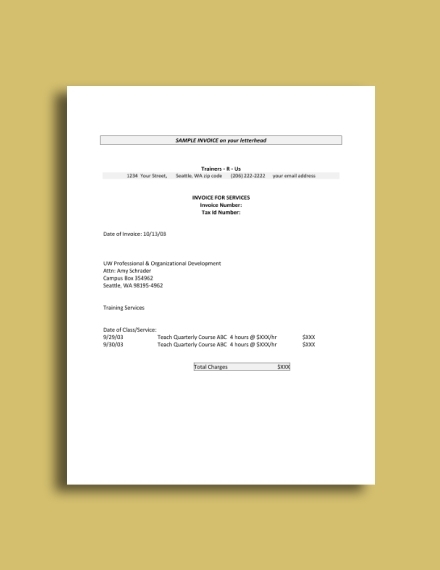 Commonly, an invoice is being confused as a receipt and vice versa. However, the two are different in a lot of ways, and you will understand this in your further reading. But overall, this article will focus on a specific type of invoice, the service invoice. Also presented are examples and templates that might be helpful for you. For your service invoice to be complete, it must contain the following essential elements. 1. The complete information of the buyer and seller: In a service transaction, the complete details of the buyer and seller must be present in a service invoice. This includes the name, address, and contact details of the buyer and seller. These information must be clearly presented in the service invoice. 2. Terms and conditions: The most simple and direct form, the terms of conditions regarding the service transaction must be specified in the invoice. It must also be concise and brief, avoiding ambiguous words, in order not to be misunderstood by the parties. 3. List and description of the service provided: The services provided by the seller must also be presented in the invoice. There must be an itemized list of the services as well as a short description, if any. Keep your description concise but is still understandable by the customer. 4. The value or cost of the services: Each service listed must have a corresponding value or cost. The total amount for all the services must be written as the sum of all the items, usually presented below all the amounts and typically presented in such a manner that can easily be seen by the customer. 5. Charges and fees: It is fitting and proper that the customer will be informed of the charges and fees aside from the main payable amount from the services. This may include the charges for the tools or materials used while performing the services. This may also include the insurance of the service especially when doing hazardous work or job. 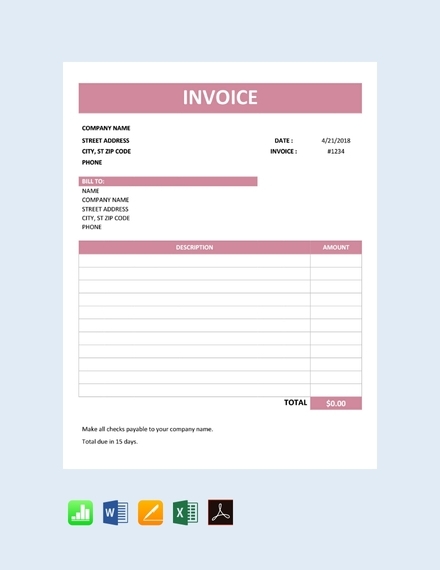 You may also see free invoice examples. 6. Unique invoice number: For easy tracking, monitoring, accounting, and auditing of all the receipts, a receipt must bear a unique identification number, an invoice number. There must be no two invoices that has the same invoice number. Thus, an invoice number must be unique. Note that you must record every invoice that you sent to your customers for an easy accounting and auditing. 7. Signature of the seller or service provider and date: The seller must affix his or her signature for the credibility of the invoice and to prove that the invoice was indeed made by him or her. Moreover, the date of the issuance of the invoice must also be indicated. There are a lot of programs on your computer where you can create your own service invoice. Unleash your creativity and familiarize these programs, and surely, you will be satisfied in your own design. Here are some of the simple, typically used, and yet user-friendly programs that you can use in creating a service invoice. If you know how to utilize a simple tool such as the MS Word, you can surely create a presentable service invoice. Open MS Word in your computer. Create a new file and choose templates from the drop-down menu. Choose a format of template that you think is best suitable for your service invoice. Now that you have chosen a format, you can now edit the template and add your own preference and important details. 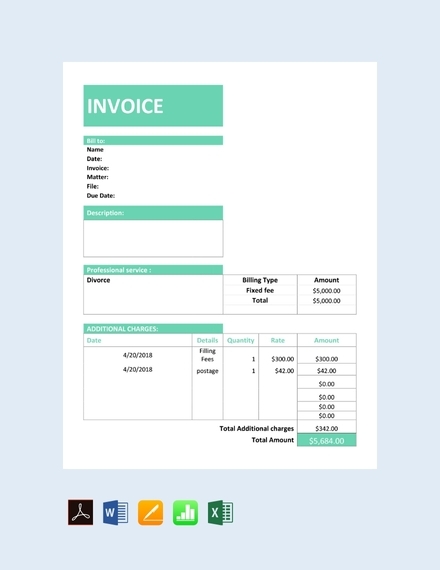 Add a header to your invoice. Included in the header are the following: the name of the business, address, contact details, and logo. The logo design is optional, but many entities would prefer to include them for branding and marketing purposes. Below the header, write the information of the client—the name and address of the client as well as the contact information. 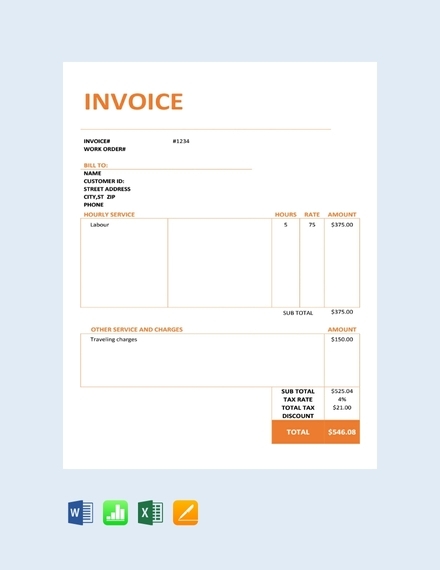 You may also see plumbing invoice examples. Do not forget to add the invoice number, the date the invoice was prepared, and the due date of the transaction. You must also indicate the method of payment and other specific details of the payment. On the middle portion of the invoice, list down all the services with their description and amount. Below all the itemized amount for all the items on the list, indicate the sum or total of all the amount. Then, add other fees, taxes, and charges, if applicable. Render the grand total in bold or with font size bigger than the other texts to emphasize the final amount to be paid by the customer. Do not forget to save before you exit, and send to print. 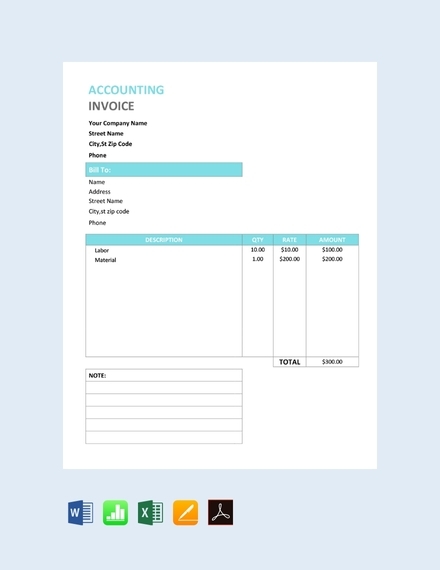 MS Excel can also help you create a service invoice with ease. 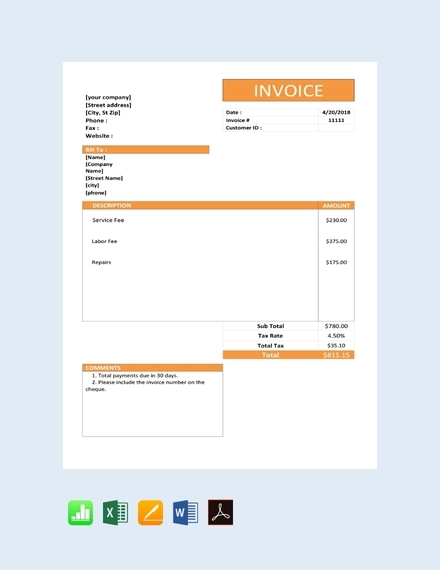 Creating an invoice in Excel can actually help you create an invoice quickly. Do not get overwhelmed with all those intersecting lines and boxes, and follow these simple steps. 2. Click “File” and create a new workbook. 3. Then, choose the Invoice icon. 4. Select the type or format of invoice that you want for your service invoice. 5. 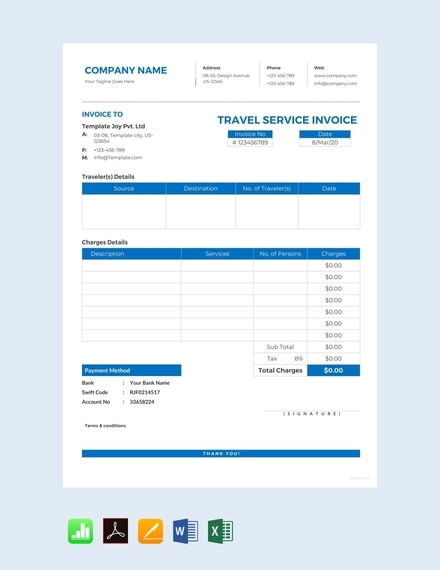 Add the essential information and elements of a service invoice such as the complete information of the buyer and seller, terms and conditions, list and description of the services provided, the cost of the services, charges and fees, unique invoice number, signature of the seller or service provider, and the date of issuance. 6. Sum up the prices and write the grand total below the amount of the itemized list of services. Do not forget to include taxes, charges, and fees, if any. 7. Finally, save your document and print. 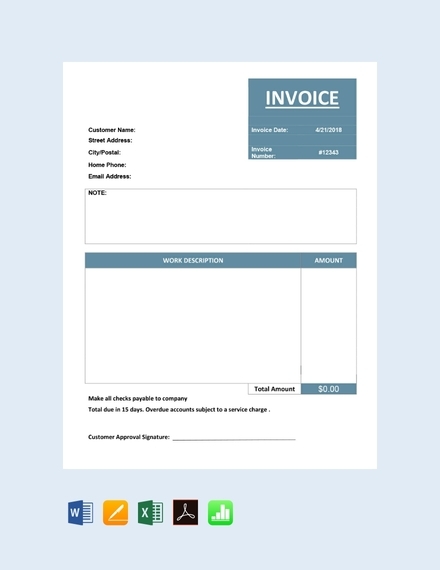 Learn how to create a service invoice in Google Docs following these simple steps. 3. 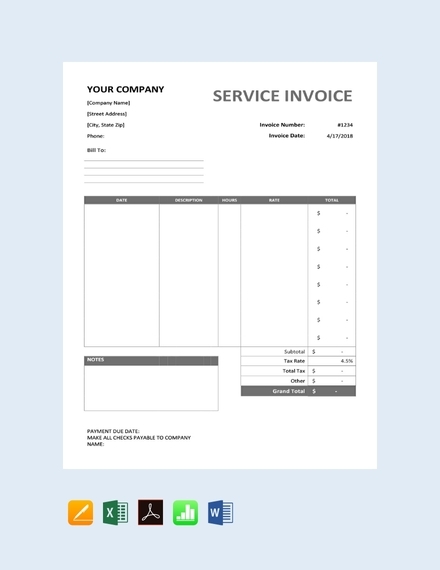 Open “New” and choose from the available templates of invoice. 4. 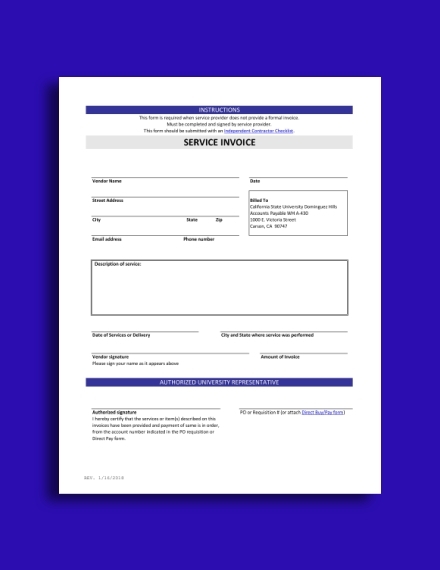 Select a template design that is suitable for your service invoice. 5. 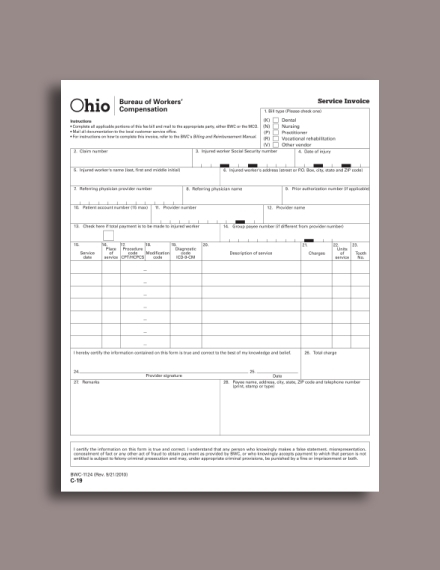 Then, fill out the template with the essential elements such as the complete information of the buyer and seller, terms and conditions, list and description of the services provided, the cost of the services, charges and fees, unique invoice number, signature of the seller or service provider, and the date of issuance. 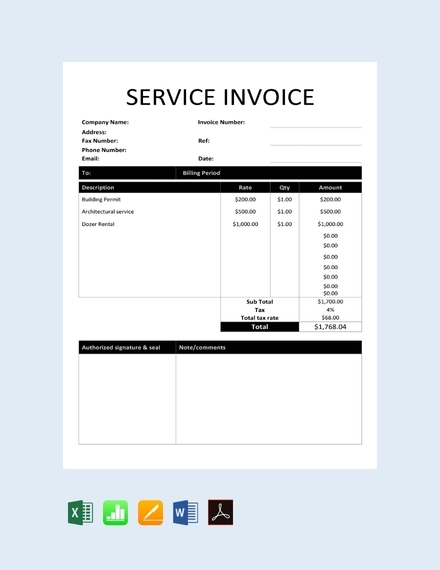 You may also see auto repair invoice examples. 6. Write the details of the transaction, and list the items, their prices, quantity, and description. 7. Sum up the prices including any taxes, charges, and fees and write the grand total below the amount of the itemized list of services. 8. Lastly, check if you have incorporated every important detail, and do not forget to save your work. 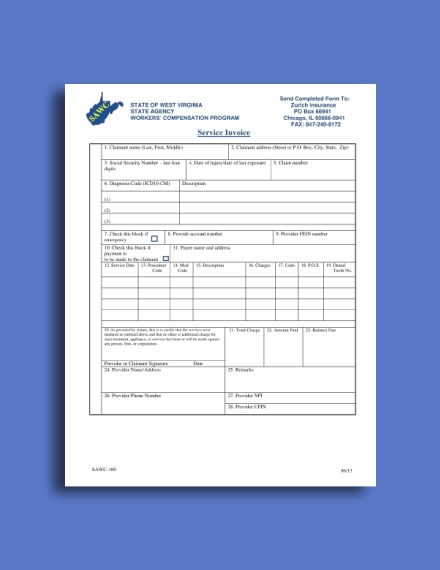 Utility Service Invoice: This type of invoice is for services that concerns providing different types of utilities to the general public such as internet, electricity, natural gas, water, sewage, telephone, coal, and even transportation. Most often, these services are government monopolies or privately owned for it to be regulated accordingly. Maintenance Service Invoice: There are also invoices that are specific for maintenance services. Examples of maintenance services include janitorial, cleaning, checking the facilities for safety, arranging seats and chairs, monitoring the room temperature, and noise control.You may also see daycare invoice examples. Accounting and Finance Service Invoice: These invoices are issued to customers who avail different accounting and finance services. These services include, but are not limited to, the following: bookkeeping, tax accounting, financial controller, forensic accounting, internal auditing, external auditing, managerial accounting, cost accounting, public accounting, and government accounting. Legal Service Invoice: These invoices pertain to those that are issued regarding the request of payment of the legal service provided such as in the following areas: corporate matters, contract analysis, medical staff, litigation, fraud abuse, tax exemption, and managed care. Consulting Service Invoice: There are invoices issued for consulting services, hence called consulting service invoice. Consulting service encompasses the following: business planning, business valuation, marketing, sales, e-commerce, risk management, business acquisition and expansion, customer service and operation, and personnel planning. 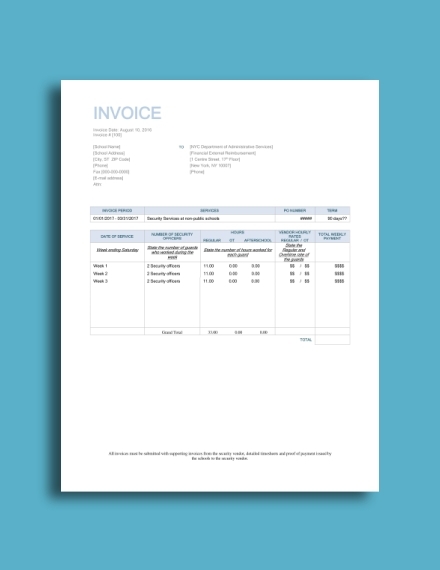 A service invoice, just like any other types of invoice, is available in the following sizes. What is the importance of a service invoice? A service invoice is important for both the service provider and the customer. On the part of the seller, it is a form of request to the customer for the payment of the services rendered. On the other hand, a customer is in need of an invoice to know the amount needed to be paid and to clarify and keep track of the transaction. What to do before you start invoicing? Before you start invoicing, you must consider using tools and software that can help you manage your invoicing and recording the sales transaction. You must also gather important information of the customer such as their name, address, phone, and email. Also establish a method of payment and the payment terms. 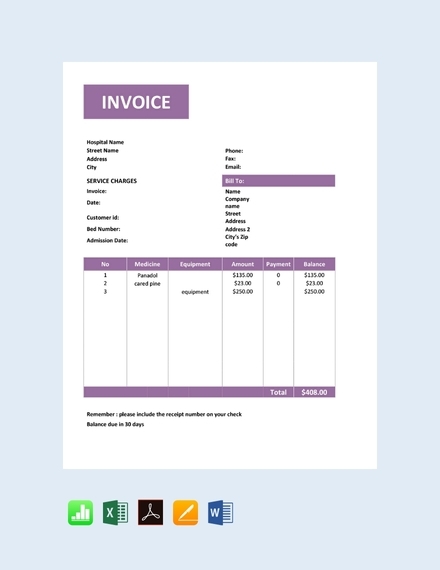 You may also see invoice examples. When to issue an invoice to customer? Invoice, as stated above, is a form of a reminder or a request of payment from the customer for the amount due. Generally, the process in a sales transaction begins with the customer, sending a request order to the seller, then the seller will provide the service and issue the receipt. Hence, an invoice is issued before the receipt. What are the primary concerns of customers in your invoice? If you are the seller, try to put yourself in the customer’s shoes. What do they need from your invoice? What information do they want to know through your invoice? Basically, they need to know the following: billing terms, late payment charges, purchase order number, your contact information.